Organic produce usually costs more than conventionally grown varieties. For this reason, many shoppers opt for the cheaper route. Conventionally grown produce is typically found throughout grocery stores. 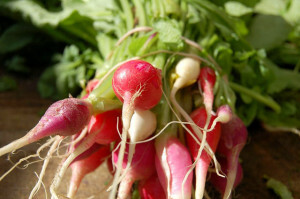 It’s mass-produced, often sacrificing quality and flavor for larger yields. In order to produce such large quantities, produce can be chemically ripened and preserved to speed up the process. If you routinely get stuck deciding if that organically grown tomato is worth the price, here are 5 reasons organic produce is better for you. If you use a bug spray or bleach solution in your house, you probably don’t spray it into your mouth. We don’t eat chemicals, so it’s important to avoid them in your food. Conventionally grown produce uses pesticides to control pests on a mass scale. Even if you wash your produce before you eat it, the pesticides pollute the water around the plants. This means the pesticides are inside the fruits and vegetables themselves. Conventionally grown produce takes time to process and travel to your grocery store. This means that sometimes growers use some form of preservatives in their growing process to extend the life. Certified organic produce isn’t allowed to use preservatives in their growing process, making them healthier alternatives. Preservatives are chemically based and just as bad for you as pesticides are. Some strawberries have fish genes to prevent frostbite. Some corn species have pesticides directly in their genes. It’s not science fiction; it’s GMOs, or genetically modified organisms. Scientists modify these plants to grow better, but have no idea how they impact human bodies over the long term. Avoid negative health impacts by avoiding GMOs. A lot of organic produce is grown locally. Shorter travel time to the grocery store mean a lot of the organic produce lasts longer in your fridge, as it was harvested recently. Without all of those GMOs, preservatives, and chemicals, organic produce tastes better than conventionally grown.